IT HAS ALWAYS made Americans uncomfortable to think of their nation as the world's policeman. John Quincy Adams avowed nearly two centuries ago that the United States "goes not abroad in search of monsters to destroy"; today, Barack Obama declares that America's focus must be on "nation-building here at home." A broad swath of public opinion shares that view — 52 percent of Americans in a Pew survey last winter agreed that the US should "mind its own business internationally and let other countries get along the best they can on their own." Influential Americans regularly argue that US intervention abroad does more harm than good. "Every time the US touches the Middle East, it makes things worse," insists Harvard's Stephen Walt in a recent essay. The same has been said about America's military involvement everywhere from Latin America to Indochina. Samantha Power, currently the US ambassador to the United Nations, wrote in 2003 that America is justifiably seen as "the very runaway state international law needs to contain," resented for its "sins" and "crimes" in using its power to harm others. Tim Kane, an economist at Stanford University's Hoover Institution, begs to differ. 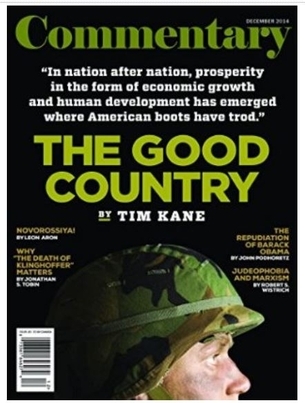 In an eye-opening essay in the current issue of Commentary, Kane refutes the notion that American military deployments have been a force for ill. That view isn't just wrong, he emphasizes, "it is tragically wrong." He backs up his claim with data: "Having compared growth and development indicators across all countries of the world against a database of US 'boots on the ground' since 1950, I've discovered a stunning truth: In country after country, prosperity — in the form of economic growth and human development — has emerged where American boots have trod." America's war record has certainly been mixed, acknowledges Kane, an Air Force veteran who has written — sometimes controversially and at book length — about the military's stifling personnel policies and its strategic shortcomings in Iraq and Afghanistan. Troop deployments haven't always ended well. US forces haven't always lived up to our highest standards. But American military engagement worldwide goes far beyond battlefields. Between 1950 and 2010, more than 30 million US troops were stationed overseas, Kane writes, and except for four years at the height of the fighting in Vietnam, most troop deployments were not to nations at war. The great majority have typically been in "allied countries, stationed in permanent bases, and cooperating in peace." Some host countries are well known: Japan, Korea, Germany. But Americans in uniform have been based in many other countries, too, from Bahrain to Kyrgyzstan to Panama to the Philippines. And when the data is crunched, what emerges is extraordinary: US boots on the ground are a startlingly robust predictor of higher growth rates and longer lives. Since the 1950s, research by Kane and economist Garett Jones of George Mason University has shown, "countries hosting more American forces experienced much faster economic growth than their peers" — an increase in per-capita growth of about 1 percentage point per year, after controlling for other numerous other factors linked to economic growth. The statistical correlation between US military presence and economic growth is found even when "high-growth outliers," such as South Korea or Germany, are excluded. Just as dramatic is the rise in life expectancy and reduction in child mortality in countries where US service personnel are based. The effect shows up, Kane says, even for countries growing at the same rate. To be sure, life expectancy has increased almost everywhere over the past two generations. "But it improved more quickly in countries that hosted American troops, and more slowly elsewhere." What Kane dubs the "good country effect" isn't entirely understood. Why, for example, should a tenfold increase of US troops over 20 years in a typical host country lead to a reduction in children's mortality by 2.2 percentage points and a 1 percentage point gain in life expectancy? Access to more US dollars isn't a sufficient explanation: The improvements remain statistically significant even after accounting for economic aid. And plainly the United States doesn't undertake military deployments in pursuit of an imperial growth scheme aimed at creating wealth. "There was no material advantage to saving South Korea, a bloody and costly war that ended well," Kane observes. "And there was nothing to be exploited in Vietnam, an even bloodier and more costly war that ended badly." Recent history is replete with examples of allies, such as South Korea, Kuwait, and Japan, that welcomed the deployment of US troops on their soil. Such countries have experienced faster economic growth and greater increases in life expectancy than their peers. 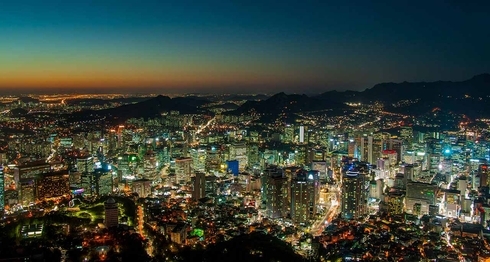 Above: Seoul, the capital of South Korea, where tens of thousands of US troops have long been stationed, and where per capita income has increased 18-fold. The empirical advances in human welfare spurred by the presence of US forces can be linked to factors as specific and tangible as the proliferation of telephone lines, which — besides being necessary for military communications — helps connect remote rural communities with medical workers and emergency assistance. They may also be linked to the proliferation of cultural ideas and civic institutions. With American military engagement come American ways of doing business, of training police forces, of resolving local disputes, of strengthening democracy and the rule of law. Economic analysis won't end the debates over America-as-Globocop, nor should it. Foreign and national-security policymaking is complex, and every deployment of troops must be justified on its own terms. Nevertheless, the data underscore a reality we ought not lose sight of: The projection of US power has been a remarkable force for good in the world. Where American boots tread, prosperity and better lives generally result. Trump doesn't care about Montenegro. He should.